The benefits of coconut water are truly amazing, one of the most amazing liquids on the planet! helpful with gastrointestinal stress, diarrhea, dehydration, malnutrition, candida to name a few. 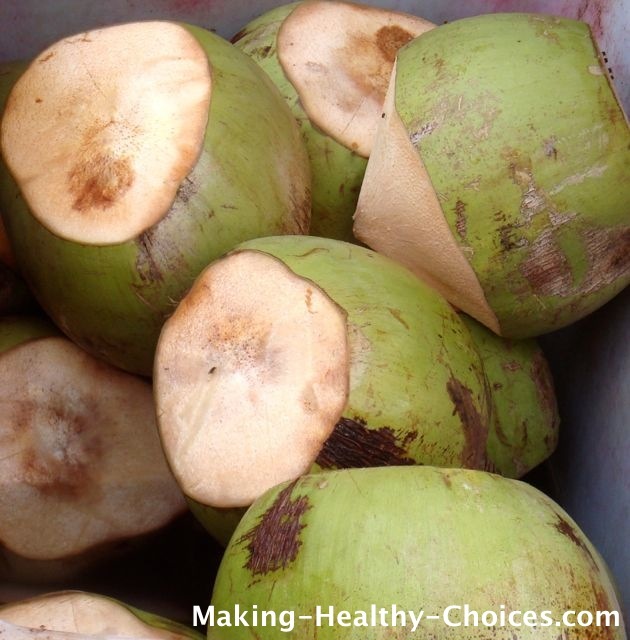 Coconut water has a molecular structure that is very similar to the plasma of our blood. In fact, I have heard that coconut water has been used as an emergency transfusion during war times in the past. Drinking fresh coconut water will hydrate you very quickly and since it is one of the best sources of electrolytes out there, it makes it an ideal drink. Leave those sugary sports drinks on the shelf and reach for some fresh coconut water instead! If you live somewhere in the world where coconuts grow then eat away to your heart's content. But, if you don't then use sparingly. It is a very healthy practice to eat food that is as local to your region as possible. Regularly consuming foods that are imported from far away costs much in global resources, does not assist in keeping you grounded to where you are and every time a food crosses a border it can be sprayed or irradiated. Imported coconuts are also treated with chemicals to keep them fresh looking during transport. Use imported foods sparingly, if at all, and for special occasions only - not as a part of your regular intake. In the tropics, where coconuts grow year round, people have been enjoying them for ages and have long known the benefits of coconut water. 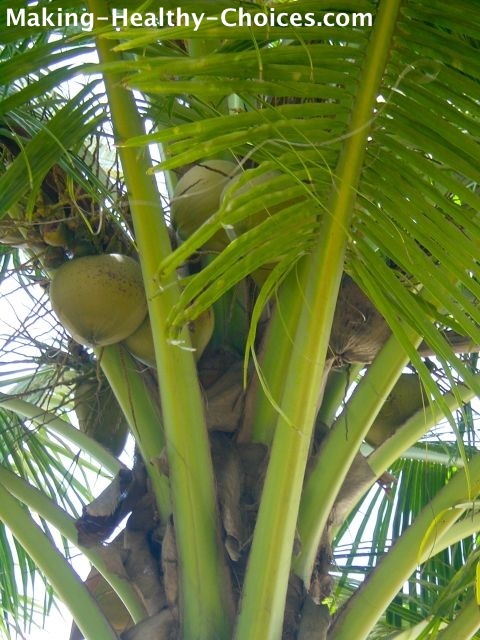 Actually every single part of the coconut palm tree is used, making it such a great plant in so many ways. 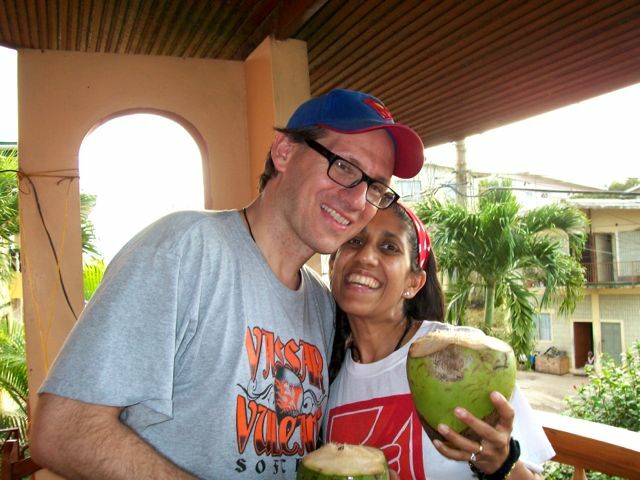 I spend as much time in the tropics as I can and when I am there I get to feel the benefits of coconut water first hand, along with enjoying that gorgeous coconut meat. For generations people have known of the benefits of coconut water .. it truly is an ancient food. Eating foods like this that are ancient and have been unchanged much from their original form delivers perfect nutrition and ancient wisdom directly into our cells. Learn from our elders and ancestors - they know! 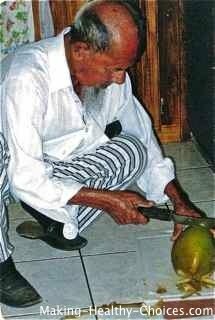 Here is a picture of my Grandfather at age 93 opening a coconut for me, fresh picked from the tree just moments earlier. In the tropics coconuts can look like the pictures above and below (there are many varieties of coconuts - they can be orange/yellow and slightly different shapes too) and are usually opened by locals who are very adept and quick at using a machete. If you buy an imported coconut at a store it will most likely be a young Thai Coconut and look something like the picture below. Here they have removed the outer green husk. To open one of these coconuts see the 3 minute video below where I show how I open the coconut, drain the water and scoop out the meat. If the video isn't playing below, click here. The benefits of coconut water can be enjoyed when drinking the water fresh from the nut and this is, by far, my most favourite and recommended way of ingesting it. But you can also use coconut water in your smoothies and ice cream recipes too. The benefits of coconut water are so numerous that I feel I have only touched the surface on this page. 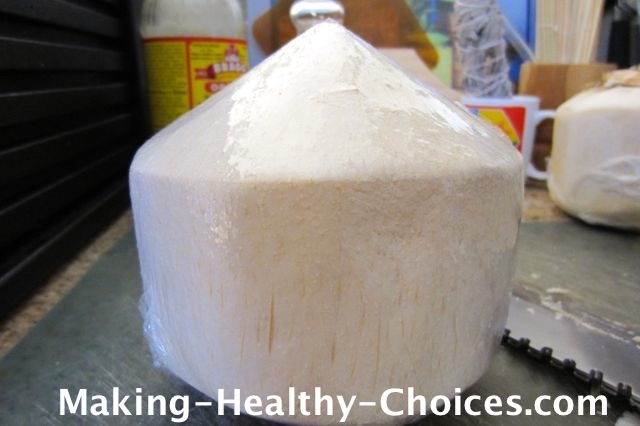 More than what science tells us, I know coconut water to be amazingly beneficial simply by how great I feel when ingesting it, because it has been around as a food for so long and because of the wisdom of my elders that have been enjoying coconut water and the entire coconut palm for generations.